Everyone worries about houseguests overstaying their welcome. But is it really because the guest infringes on the host or does the host realize that they are infringing upon the guest whose very existence holds up a mirror that forces the host to see themselves in a way they’re not willing to face? Perhaps the reason we want guests gone isn’t because they’re too comfortable in our home but because we’re not comfortable when they’re there. Letting others wander into the weird, little worlds we call our private home life can lead to unwanted reflections and more questions than we’d like. And feelings of internal questioning are always strongest in our younger and more vulnerable years – everything from body image to burgeoning sexuality to even something as innocuous as the food we eat are all magnified in adolescence. It's awareness of these concerns that makes filmmaker Michiel ten Horn’s study of three young adults thrown into existential crisis by the arrival of a foreign exchange student in The Deflowering of Eva van End all the more fascinating. Understanding that females of this age swim in the roughest of waters, screenwriter Anne Barnhoorn centers most of the action on and from the point-of-view of awkward and shy fifteen-year-old Eva van End (Vivian Dierickx) in this Dutch reimagining of Pier Paolo Pasolini’s Teorema infused with Welcome to the Dollhouse era Todd Solondz dramedy. Though he relies on his own memories of having a German exchange student visit his home as a teenager for inspiration and authenticity, ten Horn’s background as an animator provides a creative blend to the sweet-and-sour flavor of this newly released Film Movement series DVD, adding a feeling of magic realism to some scenes that would otherwise prove too hard to stomach. Admittedly some of the plot-points do feel manipulative at best –particularly in the weakest storyline of Eva’s rebellious, pot-smoking ladies man brother Manuel (Abe Dijkman) who views the arrival of the blonde German “pretty boy” (Rafael Gareisen) as a threat. 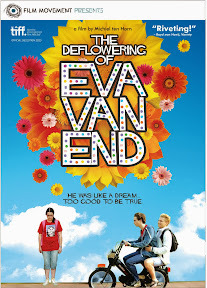 On the other hand, The Deflowering of Eva van End is most successful when it explores the – albeit underdeveloped – plotline of her sexually confused engaged oldest brother (Tomer Pawlicki) as well as navigating the newly awakened global socioeconomic conscience of her father (Ton Kas). Taking a cue from the seductive, spiritually ambiguous visitor in Pasolini’s Teorema, the perpetually white-clad exchange student Veit manages to seduce every single one of the van Ends. He does this however in very different ways – from encouraging Eva’s unappreciated mother (Jacqueline Blom) to center herself with meditation to calling the others to action and (as the title promises) getting Eva some action as well. And as the oft-perceived ugly duckling Eva tries to take it upon herself to become a swan, this well-intentioned but ultimately uneven film uses Veit as an agent of change but ensures that in the end, the van Ends have free will in all matters. Fifty shades darker than Juno, The Deflowering of Eva van End is definitely for an acquired taste. And even then its startlingly tragic final act feels entirely too shocking to adequately balance its earlier purported Wes Anderson-esque theme to proudly let your freak flag fly. Yet this self-consciously eccentric film is nonetheless worth a look for adventurous cineastes in need of a palette cleanser from too many cookie-cutter coming-of-age stories looking for something different altogether. While unfortunately Eva is one of the least interesting characters in the film and one that becomes even harder to empathize with given an sickeningly symbolic, manipulative twist involving an animal that comes off as unreasonably cruel, the true star of the picture is the one seeing himself through Eva’s eyes in the form of filmmaker ten Horn in his feature-length debut. Boasting two of the filmmaker’s earlier shorts including the delightful Arie and intriguing Basta that help foreshadow his transition to long-form moviemaking, Eva arrives fresh off its successful international festival run. Previously chosen as an official selection in Film Movement’s DVD-of-the-month club, Eva van End is now available to download, rent or purchase, depending (of course) upon how long you’d like this Dutch visitor to stay in your home.